On this date in 1944, a day after the historic Bene­dictine abbey at Monte Cas­sino was bombed by Allied air­craft, the Ger­mans launched their long-delayed counter­attack on the Allied-held beach­head at Anzio, 35 miles south of the Ital­ian capi­tal, Rome. Just the month before, on Janu­ary 22, Amer­i­can and Brit­ish units under U.S. Maj. Gen. John Lucas had carried out an essen­tially un­opposed am­phi­bious landing in the area of Anzio and neighboring Net­tuno, Italy. By the end of first day of Oper­a­tion Shingle, 36,000 Allied soldiers and 3,200 vehicles had stormed ashore, cap­tured the port of Anzio, and were poised to out­flank strong Ger­man defenses along the Gustav Line cen­tered on Cas­sino south of Anzio (see map below)—defenses that were holding up the Allies’ the liber­ation of Rome. A jeep recon­nais­sance pa­trol had even made it as far north as Rome’s out­skirts. Unfor­tu­nately Lucas failed to ex­ploit his ad­van­tage of sur­prise, delaying his ad­vance until he judged his posi­tion suf­fi­ciently con­soli­dated and his troops ready. The Ger­man com­man­der in the Italian theater, Field Marshal Albert Kessel­ring, moved every spare unit to be found into a ring around the Allies’ narrow beach­head, an area 15 miles long and 7 miles deep. By early Febru­ary Kessel­ring had roughly 100,000 troops poised against Allied forces, which by this time totaled a little more than 76,000. With the launch of Opera­tion Fisch­fang (Operation Fish Trap) on Febru­ary 16, Ger­man in­fan­try­men and tanks shrank the Amer­i­can pocket over the next five days before reaching a vicious stale­mate with their foe. Each side lost nearly 20,000 men since the Janu­ary landings. Aside from Lucas being relieved of his com­mand and sent home, the situ­a­tion on the ground would not change until late May, when the north­ward moving U.S. Fifth Army’s front under Lt. Gen. Mark Clark merged with the Anzio beach­head. The road to the Ital­ian capital was now wide open, and Clark took full ad­van­tage of it, sur­prising his com­manding offi­cer, British Gen. Harold Alex­ander, and even Romans them­selves when he trium­phantly entered the capital riding in an open jeep on June 5, 1944, one day before Allied landings on the Nor­mandy coast in France abruptly yanked the world’s attention from Italy to northwestern Europe. Above: German-prepared defensive lines in Italy south of Rome, 1943–1944. The pri­mary line was the heavily defended Gustav Line (red in map) centered on the town of Cas­sino, which inter­dicted traffic north on Route 6. 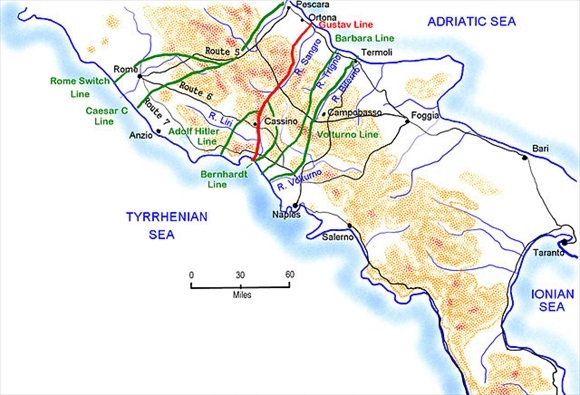 Opera­tion Shingle, the Anzio offen­sive (Janu­ary 22 to June 5, 1944), was designed to out­flank the Gustav Line defenders and capture Rome by moving up the coast along Route 7, the ancient Via Appia (Appian Way). Left: Anzio, a coastal town on the Tyrrhenian Sea, was the site of a major amphib­ious assault by the U.S. VI Corps, U.S. Fifth Army, in late-January 1944. The Anzio offen­sive had been championed by British Prime Minis­ter Winston Churchill, but it fell largely to Amer­i­can troops to carry it out. Landing two Allied divi­sions behind enemy lines was intended to force the Ger­mans to evac­u­ate the Ital­ian penin­sula and, it was hoped, shorten the war. For their part Field Marshal Kessel­ring and the Ger­man army under his com­mand refused to play their assigned role and, with the arrival of re­in­force­ments, nearly wiped out the Allied troops pinned down on the Anzio beachhead. 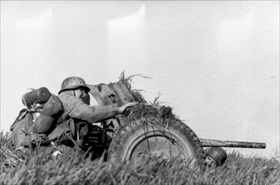 Right: German paratroopers with artillery piece in the vicinity of Net­tuno (near Anzio), Italy. Gunners like these in the Alban Hills had a clear view of every Allied posi­tion on the Anzio beach­head four miles away. 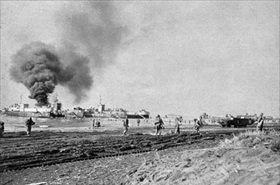 The Battle of Anzio lasted four months, the Allied side being supplied by sea, the German side by land through Rome. In May 1944 the Allies broke out of Anzio and took Rome. 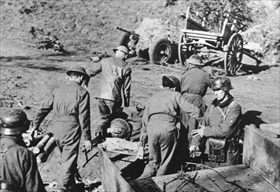 German forces escaped to regroup north of Florence at the Gothic Line. Left: Captured German soldiers on the Anzio beach­head are being moved to an Allied pri­son camp, Febru­ary 1944. The Ger­mans and Ital­ians suffered 40,000 ca­su­al­ties, of which 5,000 were war dead. 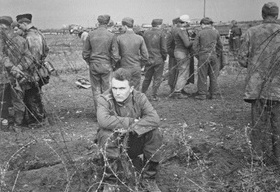 The Allies took 4,500 prisoners. Right: British and American prisoners of war move their wounded com­rades to a Ger­man aid station near Net­tuno, February 1944. The Allies suffered 43,000 casu­alties, of which 7,000 were killed.